Rick Lewis with one of of his most recent portraits. Tyrone is one of Lewis' newest paintings highlighting the intersection of race and age. To encounter the art of Rick Lewis is to experience stereotypes be stripped away. Through his series of 13 portraits of African-American men, (In)Visible Men: Examining Stereotypes Through Art, Lewis invites his viewers to suspend their judgement. All of us come from different backgrounds and hold judgements, positive or negative, related to black men. “Take the average white person who doesn’t know you and never had an encounter with a black man versus an African-American female who looks at that painting and sees a family member, former lover or maybe a cousin. All receive different reactions,” Lewis states. Lewis creates photorealistic portraits of African-Americans to give the viewer the ability to look intently at the subject as an individual, and hopefully, absorb some small part of their story. The artist believes many people are afraid to make a connection with a black man and that art is a safe medium through which to do that. Lewis retired from Illinois State University in 2016 after a 30 year career in administrative work. During the majority of that time, his practice was on hold until he realized in 2013 that he was nearing retirement and decided it was time to revisit his love of painting. Lewis capitalized on his experiences mentoring black men during his career at Illinois State as the Associate Dean of Students. He wanted to break down the barriers between urban Chicago and predominantly white populations by giving the black models a status of celebrity through his art. Lewis’s art continues to evolve. 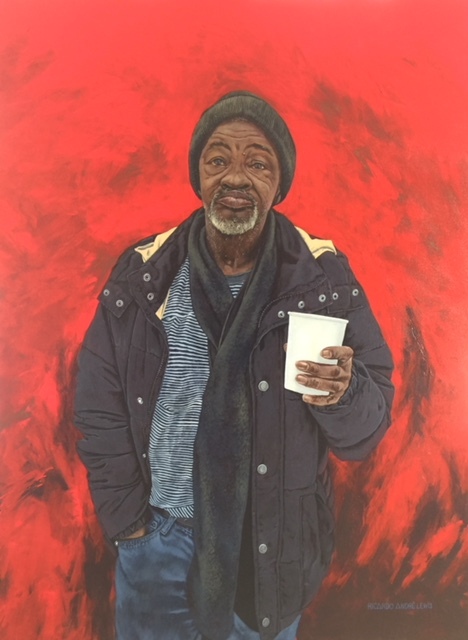 His painting Tyrone is one of the newest portraits in the collection and a transition piece for Lewis as he moves into painting senior citizens, another group that has been pushed to the margins of society. Lewis’ art has been on display throughout McLean County, Peoria, University of Illinois, and Chicago, as well as Illinois State. The (In)Visible Men series was on display at Dittmar Gallery at Northwestern University in Evanston, Illinois through March 22, 2018. Susan Fish received her Bachelor's in Communication and Public Relations and her Masters in Communications, Advertising and Marketing from Illinois State University. She has taught the Communication 110/Critical Inquiry class for over 10 years at ISU.